Marvel has been busy in the past week or so. Between casting confirmations and fallout from the Ant-Man fiasco, there’s a lot of things happening. Though not enough on their own to warrant an entire article, together they make for one MARVELous update. So sit back and get ready to catch up on everything that’s been going on with Marvel Studios. One of the lesser-known outlets of the Marvel Cinematic Universe has been their ‘One-Shots’, which usually accompany the release of a feature film on Blue-Ray/DVD. Well when Captain America 2: The Winter Soldier hits Blue Ray/DVD September 9th, a One-Shot will be noticeably missing from the set. But what’s so special about a 10-minute film, and why is it being left out this time around? The Marvel One-Shots might not be known to the casual Marvel Studios fan, but they have become a pivotal piece in the Marvel Cinematic Universe that not only set up possible storylines, but also created two television series. The One-Shots for Thor, Captain America and The Avengers – titled ‘The Consultant’, ‘A Funny Thing Happened On The Way To Thor’s Hammer’ and ‘Item 47’ respectively – detailed how Coulson and other S.H.I.E.L.D. Agents dealt with security issues both domestic and at large. As you can guess, those three One-Shots helped pave the way for Marvel’s Agents of S.H.I.E.L.D. ; but they’re not the only ones. The Marvel One-Shot for Ironman 3 entitled ‘Agent Carter’ just earned its own TV series, which will air on ABC next Winter. As for the One-Shot for Thor 2: The Dark World titled ‘All Hail The King’, that calmed a lot of upset fans and set up the Mandarin as an actual force of evil – rather than just an actor. Whether this will be explored in a possible Ironman 4 or the second season of Agents of S.H.I.E.L.D. – depending on the identity of Skye’s father – remains to be seen. Marvel’s released a One-Shot for every film of theirs from Thor onward, so why stop now? The answer is honestly because they’re too busy. Some might think this is the big studio turning their back on their smaller projects now that they’ve made it big; but that simply isn’t the case. Between filming for The Avengers 2: Age of Ultron, putting finishing touches on Guardians of the Galaxy, starting work on Agent Carter and the second season of Agents of S.H.I.E.L.D., their four new Netflix series, and trying to get Ant-Man back on track after Director Edgar Wright left, Marvel has a lot on their plate. When the news of Edgar Wright’s separation with Marvel came last week, rumors flew left and right about who was wrong, who was right and what caused the break up. Guardians of the Galaxy director James Gunn summed it up best by comparing the entire situation to two mutual friends trying to get together: sometimes it just doesn’t work out and there’s nothing you can do about. Some people just aren’t meant to be together. In keeping with that relationship/friendship analogy, the accusations and back-handed jabs began flying. Wright at one point even posted a photo which – in short – seemed like a veiled/yet obvious comparison of his situation to when Buster Keeton felt he ruined his career by working with MGM. The photo in question was immediately taken down afterwards. There’s been a ton of rumors of new directors, including one that said James Gunn would take over – to which he responded that it’d be like sleeping with a best friends ex right after they broke up – but these are all false. It turns out Marvel didn’t have a replacement already set, but they are currently meeting with possible replacements. An announcement should be made within the next week or so. It’s uncertain if Ant-Man will still keep its July 17th, 2015 release date, but Marvel says not to fear. They’ve worked wonders in the past; so let’s have some faith. A few weeks ago, Marvel announced that they would be partnering with Netflix to produce four mini-series based around the characters Daredevil, Ironfist, Luke Cage and Jessica Jones which will all end in a special event entitled The Defenders. Filming begins this July and is still hoping to have a Summer 2015 Netflix release. After many cast rumors, the first role has been cast and Boardwalk Empire’s Charlie Cox has been chosen to play the blind superhero Daredevil (aka Matt Murdock). In addition to Cox’s casting, showrunner Drew Goddard (best know for his work on Buffy The Vampire Slayer) has stepped down in favor of starting work on Sony’s The Amazing Spiderman spin-off The Sinister Six. Don’t worry about this being another Ant-Man fiasco. Goddard might no longer be producing, but he will still remain involved with the show as an Executive Producer. As for his replacement, Steven DeKnight (known for his work on the Starz series Spartacus) has already stepped up and is ready to get started. No other casting has been done for the Netflix series yet, but Clark Gregg wants in. Now that Agent Coulson has been promoted to Director Coulson, Clark Gregg hopes that he can have a Nick Fury-esque cameo in not only Daredevil, but also Ironfist. Gregg is a huge Ironfirst fan and would love a chance to be involved with the master monk in what he calls “a huge geekout moment”. Here’s hoping he gets his wish. Aside from Netflix series, Agents of S.H.I.E.L.D. 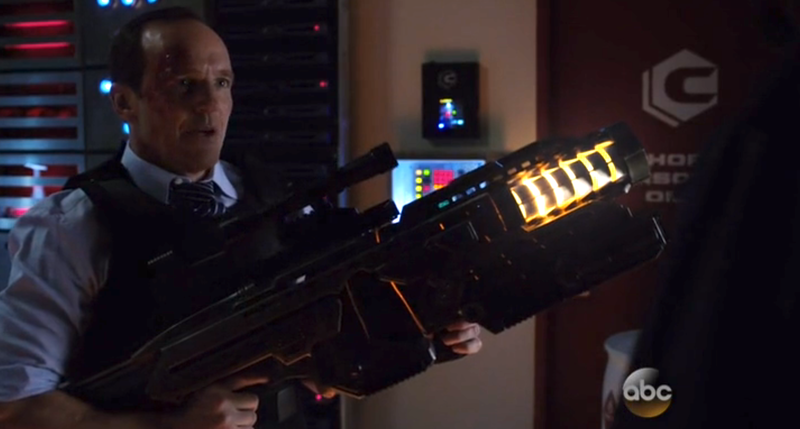 second season will be under way soon, which is sure to keep us satisfied with our weekly dose of Coulson. Meanwhile Season 1 of Agents of S.H.I.E.L.D. will be released on Blu-Ray/DVD on September 9th to coincide with the Captain America 2: The Winter Soldier release. As for any appearances in The Avenger 2: Age of Ultron, that remains to be seen. Gregg hasn’t heard anything yet, but all it takes is one quick shoot – much like Fury’s in the original Ironman. The final news update is hot off the press and was just made official an hour ago. Josh Brolin has been cast to play the Mad Titan Thanos in Guardians of the Galaxy. Now if you don’t remember who Thanos is, he’s the big purple guy who smiles at the post credits of The Avengers when told that fighting Earth would be “to court Death.” Thanos’s role will become much larger in The Avengers 3, which Guardians of the Galaxy begins to lay the groundwork for. Announcing this role is not only a great way to start closing Phase 2, but also a chance to look ahead to Phase 3. It’s ridiculous how huge Marvel Studios has become in a few short years; and they show no sign of slowing down. Be sure to subscribe and stay tuned for more updates that are sure to arrive in the coming weeks.